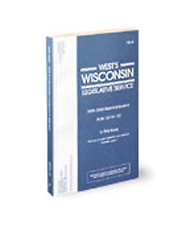 As new legislation is passed, the Wisconsin Legislative Service provides the text of new Wisconsin laws that amend, repeal, or otherwise affect existing statutes in multiple, softbound pamphlets. This series also covers legislation containing provisions that are not general and permanent in nature. Pocket Part - VOLS Copyright Volume Supp.Pamph.